I’m not a resolutions guy, but I told myself that I wanted to start writing more. Let’s consider this a wholehearted attempt. I think Facebook has just made it too easy to post life updates. Facebook is also a dangerous place to get stuck in mindless scrolling and consuming. It’s sad when I want to go back and see what we were doing on or around a date in a certain year and it’s not here. It might be on Facebook. Anyway, I celebrated my 43rd birthday on Saturday. I don’t really get excited about my own birthdays anymore. You get older and every day is just another day. And I don’t really like being the center of attention. I’m always tempted to change my birthdate on Facebook to spare the “happy birthday” posts on my wall. I never do though. I secretly appreciate the thoughts, although I’m admittedly bad about posting happy birthday on others’ walls. I think I don’t tell them happy birthday because I don’t want them to tell me happy birthday. I think I’m just weird like that. My birthday was relatively uneventful by design. I went for a 5-mile run with my neighborhood run club. Nobody knew it was my birthday and I didn’t tell anyone. It was a beautiful and crisp morning. Then I drove home and we pretty much did nothing for the rest of the day. Elise had a bunch of work that she needed to do, so she was glued to the computer for most of the day. I finished reading David Goggins’s “Can’t Hurt Me” while laying on the couch. At 4 o’clock we decided it was time to get out of the house, so we went to Costco to pick up some photos that Elise had sent to get printed. Then we ran over to Office Depot so Elise could get some other things printed. I didn’t want to make a big to do or pay a bunch of money or contend with crowds for dinner, so we went to Slab Barbecue for brisket sandwiches. 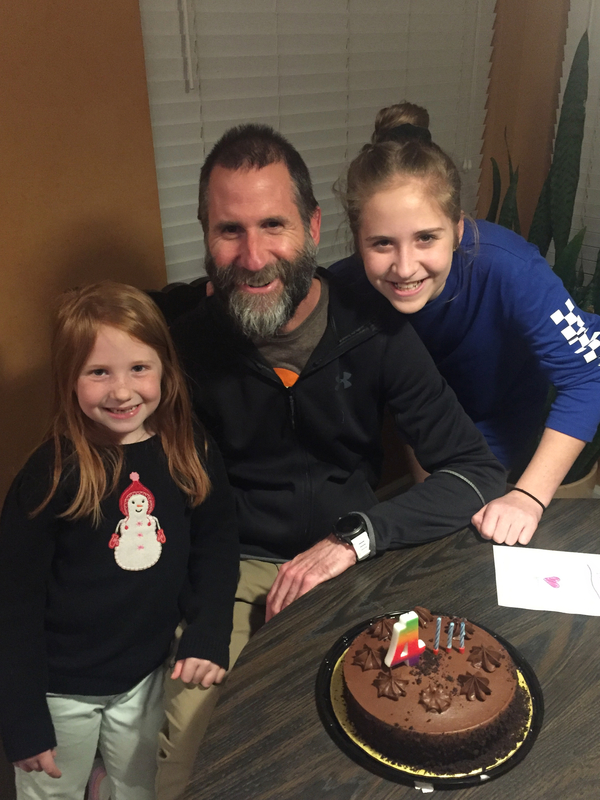 We came back home after dinner, the girls sang happy birthday to me, I blew out candles on the chocolate cake they’d gotten for me, and then we played Apples to Apples for a good two hours while I curated and played hit 80’s and 90’s rock songs on Spotify. This was spurred by the fact that Eddie Van Halen and I share the same birthday. We put the girls to sleep late, Elise and I watched the news and another barely chuckle-worthy episode of Saturday Night Live, and then went to bed. The older you get, the faster the years go by. Our firstborn is going to be a teenager in less than three months. Every picture I see of myself, I see more lines and gray. But that’s okay. I’m fine with that. I hope the running helps keep me healthy and feeling young. We also started a 21-day plant-based diet on Sunday. I’m totally okay with this life and being 43. Life is good. I have plenty to laugh at, and I like to try to make other people laugh so they’ll like their lives a little bit more, and realize that life doesn’t really need to be that serious.